Smartphone dictation that is easy to use. Dictation on the fly. 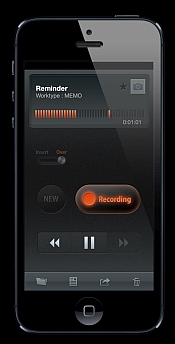 Smartphone dictation Apps allow dictation on the move. Dictate from anywhere via your smartphone and have the audio files sent to wherever the transcriptionist is located. Smartphone dictation apps allow files to be sent via email or FTP. Secure transmission and with the encryption feature, completely HIPAA compliant. Files transmit thru customers phone to a secure Olympus or Philips server then to their final destination. More Information. 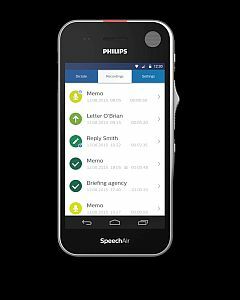 Philips Smartphone Dictation App The Philips Recorder for iOS or Android is an app that allows professional dictation on a smartphone with either operating system. Allowing for on the go dictation from virtually any location. Files are sent to your transcriptionist via Email or FTP. Completely secure as files are encrypted. HIPAA compliant.